Covering in excess of 200 acres the course is set in two dramatic valleys which merge at the northern end of the course offering superb views over the local countryside. Carefully positioned bunkers, raised tees, tree lined fairways and two teasingly placed lakes mean a good test of a golfers repertoire is required. Full irrigation, including all fairways and USGA specification greens and tees mean the course is in top condition all year round. The golf course, designed by David Williams, meanders through dramatic rolling countryside populated by thousands of mature trees which further enhance the appeal of the setting. The topography of the course is extremely interesting with two valleys merging at the northern end offering wonderful views over Farthing Downs. Complimented by a superb clubhouse Surrey National has facilities that are second to none. The magnificent building sits perched above the 18th green with grandstand views over the lake, fountains and beyond. Two large function suites on the upper floor have fantastic views over the course and are both available for weddings, dinner dances and a host of other events. 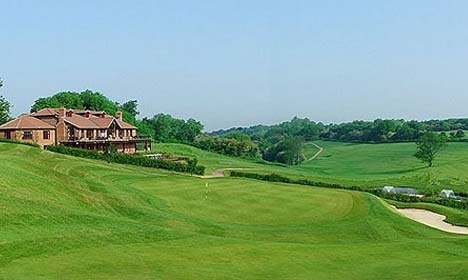 Surrey National Golf Club is suitable for golfers of all abilities with a course approaching 7,000 yards from the Championship tees and 6,300 yards from the daily play tees. These offers will be on-going until further notice and subject to course availablity.